Weight of a diamond determines its carat. An increase in its carat weight indicates increase in its price as well. Higher carat weight also increases price per carat in large diamonds, i.e. the total price of four quarter carat diamonds would be considerably less than the price for a single 1 carat diamond of comparable quality, and total price of hundred point carat diamonds would be yet lesser than the total price of four quarter carat diamonds. Like many other gemstones, diamonds are also weighed in metric carats where 1 carat = 0.2 grams which is slightly more than 0.007 ounce avoirdupois (measurement used in grocery stores). Fraction of a carat can make a huge value difference, even in the case of smaller diamonds. That is why diamonds are weighed in a thousandth of a carat and rounded to the nearest hundredth point. Diamond range starts from a small point to more than 100 carat, but in regular diamond market people shop for diamonds ranging from 5 points to 3 carat. 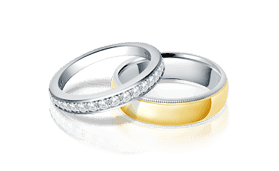 While purchasing diamonds, people generally consider the total carat weight of all diamonds present in a jewelry piece and do not talk about the individual weight of each diamond. E.g. 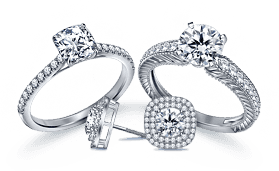 if a ring carries fifty 1 point diamonds or two quarter carat diamonds or a single half carat diamond, the total diamond weight is observed as half carat in all cases, however the prices may vary considerably, being the highest for a single half carat diamond. Cullinan is the largest rough gem diamond ever discovered and it weighs around 3,106.75 carats, while Golden Jubilee Diamond weighing 545.67 carats is the largest polished diamond. 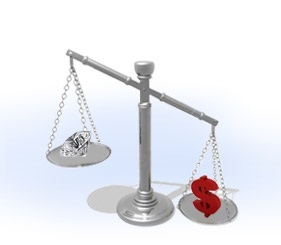 Loose diamonds can be weighed on a jeweler's balance. 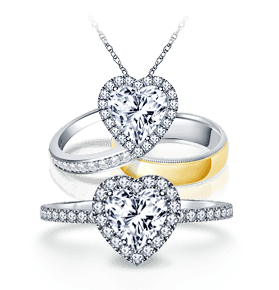 However incase the diamond is mounted, the weight is estimated using the weight-estimation formula. Estimating weight in this fashion is less precise but enough to let appraisers make reasonable evaluations without demounting the diamonds. Check out the finest quality of certified Loose Diamonds offered at B2C Jewels and select the carat weight as per your budget.